State Rep. Chris Perone (D-137), left; Republican challenger Frank Page, right. 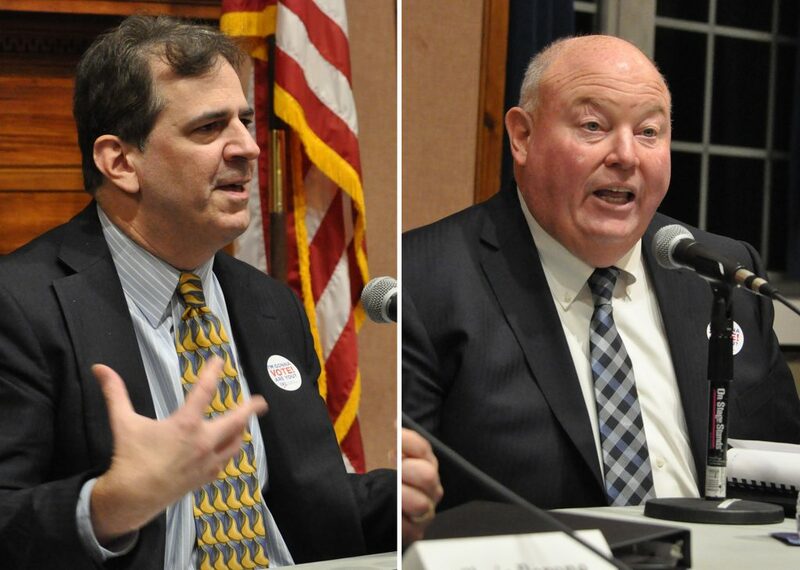 NORWALK, Conn. – State Rep. Chris Perone (D-137) and his Republican challenger, Frank Page, discussed the issues Thursday in an amiable League of Women Voters debate. Their sharpest divide was on tolls; both agreed on the importance of education, the desire to redevelop Wall Street and supporting existing healthcare programs, with Page tossing a few zingers into the conversation. Page said Connecticut needs change, to deal with “a spending problem not a revenue problem.” Perone, who has held the seat for 13 years, said he feels positive about Connecticut’s future but the state needs to plan. Asked for three priorities, Perone listed transportation, healthcare and education, particularly in retraining the workforce to fill advanced manufacturing jobs. Page said Connecticut is in desperate need of new ideas, with Democrats proposing too many new taxes. “If there is one message I want to convey to Norwalk voters, it’s that this does not need to be the way forward in our state. We do not, and can not, tax and toll our way back to prosperity,” Page said. “I am a business person, not a career politician,” Page said, explaining that he would examine the State’s finances line by line. He had been told that the State will become liquid in seven or eight years and the pension liability would need to be given a hard look, he said. “The special transportation fund is becoming a larger and larger drain on our finances,” Perone said, explaining that gas tax revenues are dropping and the deficit will affect every part of Connecticut’s budget. “I agree that we need to work on our unfunded pensions, because otherwise we’re going to get hit with this special transportation fund possibly imploding and this pension fund issue. So these do have to be a priority,” Perone said. “The only traffic light I am worried about is the stop light on spending,” Page said, going on to agree that it’s possible that the transportation fund will be raided. There is a ballot question this year asking voters to approve of a transportation lockbox. Perone said he’d gotten money for a train station study and the Wall Street area needs to be developed with an orientation toward transit. There’s been varying degrees of success since the flood of 1955, and “We have to make that a priority of ours,” he said, asserting that the Mayor’s Office and legislators have been keeping a spotlight on that goal. Page agreed that density is needed in the area, as that would be great for small business. Perone said that as funding comes in for the schools, it’s important to put it toward a great outcome for the kids, into projects like the Norwalk Early College Academy (NECA). Page said it’s nice to get public/private partnerships, and NECA is awesome. Perone said that in 2013 he heard about a program in New York State, with IBM teaming up with educators. “I basically pushed like heck and got, with the governor’s office, the first NECA program in Norwalk, in the state of Connecticut. I am proud of that,” Perone said, commenting that his son is now attending NECA. “Unless we can invest in infrastructure, we can’t move our state forward in a a way that is competitive with all the states around us, that have made transportation funding a priority,” Perone said. Page called it “really disappointing” that Perone didn’t oppose Gov. Dannel Malloy’s July plan to spend $10 million in borrowed funds to study electronic tolls. “We don’t need a study. We don’t need a $10 million study, that’s for sure. I think we can all agree on that,” Page said. “We made good progress on prescription drugs in the last session,” Perone said, calling the cost of some drugs “outrageous” and asserting that Obamacare has had a positive impact and needs to be supported. flood of 1955, or the Democratic disaster of 2018 ? Between Duff and Perone they just don’t understand plugging a hot topic without doing a damm thing about it doesn’t work. Argue all you want in their defense its ok they havn;t got one for themselves. NORWALK, Conn. (AP) – City harbor officials in Norwalk- and their counterparts along the coastline -are worried about being left behind when the new Connecticut Port Authority begins its mission to restore the state’s deep water ports. “The (port authority) legislation has given rise to more questions than answers,” said John Pinto, a member of the Norwalk Harbor Management Commission and president of the Connecticut Harbor Management Association. Pinto said harbor officials from Mystic to Greenwich are worried they will lose traditional funding for dredging and other improvements if the port authority focuses on revitalizing the state’s mostly dormant ports in Bridgeport, New Haven and New London. Time to move on folks , dont want to change your party just don’t vote for the same ole same ole clearly its not working. There is always valid arguments why the city should keep the same people , but the facts show why its time to change. Dumping toxins into the sound by Democrats over the years has been disgusting, now our DC team realize Ct simply cant do it anymore , is it a wake up call or just an election coming up? Too little too late folks. I used to be FOR the transportation lockbox, but along came the #billiondollarbridge (Walk Bridge and other projects). Now I am concerned about giving ConnDOT a dedicated pot of money to spend. Think what we could do for roads and rails if we weren’t wasting money on this bohemoth. Not to mention the money wasted lowering the roadway under the East Ave railway bridge when we should be seeking to reduce flooding opportunities.